Whether you’re just starting a business or own an established company, Bank of America has a variety of business bank account options that can work for you. 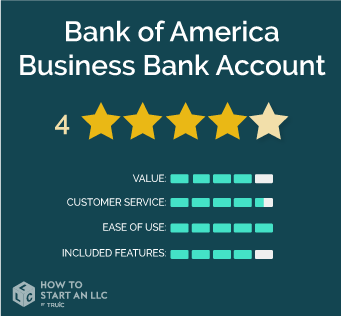 This review will go over the details of business banking with Bank of America and explain how it compares to other banking services on the market. Read on to find out if Bank of America is the right choice for you. Bank of America offers a basic variety of bank accounts focused on providing resources for small and large businesses. Bank of America sets themselves apart from most banks by offering a great user experience with their easy to navigate website and mobile app. Bank of America also makes it easy to waive monthly fees, add additional accounts, and receive some nice perks with their Business Advanced Relationship Rewards Program. One of the oldest and most well known banks, Bank of America has 67 million clients, 16,100 ATMs, and 4,400 branches, making them a great option for many businesses. Who is Bank of America right for? Any business, big or small, can benefit from the banking resources Bank of America offers. 4,400 branches and 16,100 ATMs nationwide. Great mobile app and website. Set up a savings account or additional checking accounts with an existing checking account. There are several ways to easily waive monthly fees. The Business Advantage Relationship Rewards Program offers special interest rates, significant credit card reward bonuses, fee free banking, and more. Low interest rates, even with Bank of America’s Business Relationship Rewards Program. Many added fees for things like wire transfers, account management tools, and additional deposits and transactions. Accounts are not as tailored to different types of businesses like some competitors’ offerings. Bank of America offers a few different pricing tiers. With a low monthly fee and transaction limit, Business Fundamentals Checking is designed for small businesses. Business Advantage Checking, their top tier checking account, is a great choice for businesses with a large cash flow. Bank of America also offers two savings accounts, the Business Investment Account for small businesses, and the Business Advantage Savings Account for larger businesses looking to put aside more money. You can also get a Certificate of Deposit (CD) for high interest savings at a variety of rates. Who should open a Business Fundamentals checking account? The Business Fundamentals account is a basic checking account that includes easily waivable fees, a low transaction limit, and the option to include a Business Investment Savings Account. This makes it a good match for startups and small businesses. Who should open a Business Advantage checking account? If you’re running a small/medium sized business that will have a high balance and are looking for a higher transaction limit, then the Business Advantage Checking account will be a good match for you. Note: The Business Investment Savings account cannot get the interest rate boost from the Business Advantage Relationship Rewards program. Who should open a Business Investment Savings account? The Business Investment Savings account is good for businesses that expect to have a low balance and minimum transactions, particularly small businesses or startups. Note: You can’t write checks or use a debit card for purchases (point-of-sale transactions) with this account. Who should open a Business Advantage Savings account? The Business Advantage Savings account is tailored for established businesses with larger balances, as well as businesses who may plan on enrolling in the Business Advantage Relationship Rewards Program. Who should open a Business Featured CD? If you’re looking to make a quick investment with higher yield, the Business Featured Certificate of Deposit may work for you. Who should purchase the Standard Term CD? Business owners looking for long term investments with a high yield may find the Standard Term Certificate of Deposit beneficial. Bank of America offers a Business Advantage Relationship Rewards Program for qualified businesses with multiple Bank of America checking accounts, credit cards, or savings accounts. Depending on how much money you have at Bank of America, the Business Advantage Relationship Rewards Program gives special interest rates, bonuses and discounts, significant credit card reward bonuses, fee free banking, priority services, and access to Merrill Edge online investing. For more information, check this program out here. Catering to companies ranging from startups to large businesses, Bank of America offers a fairly good selection of bank accounts compared to their competitors. Unless you’re enrolled in the Business Advantage Rewards Program, the interest rates are low, with 0.04% APY, compared to up to 0.08% APY in the rewards program. While avoiding monthly fees has never been easier, there are a lot of additional fees that you can regularly incur. On the other hand, Bank of America has a great website, mobile app, and customer service, making banking with them a seamless experience. Based on our own experience as well as online reviews, we have mostly good things to say about Bank of America’s customer service. The customer service is easy to get a hold of, responsive, friendly and knowledgeable. They can be reached through phone, online chat, mail, and in person at any Bank of America branch. The quality of their customer support stands up to their major competitors. Bank of America’s website and mobile app are some of the best we’ve seen. Banking is made quick and easy with their organized and user friendly interface. The main feature Bank of America offers is their Business Advantage Relationship Rewards Program. The Relationship Rewards Program includes features such as special interest rate bonuses and discounts, and fee free banking. The interest rate bonuses and APY top out at 0.08%, which is about even with Chase bank. Credit card bonuses offer an additional advantage, allowing card holders to earn up to 3.75% cash back on some purchases, or up to 2.62 points on all purchases. With 67 million clients, 16,100 ATMs, and 4,400 branches, Bank of America is one of the oldest and most well known banks in the United States, and can be a great option for many businesses. Bank of America’s variety of bank accounts for small and large businesses, and great website and mobile app, set them apart from their competition. Their Business Advantage Relationship Rewards Program caters to and rewards their dedicated customers. Their major drawbacks include low interest rates - even for Relationship Rewards customers - and a large number of fees. Overall, though, Bank of America is a great choice for businesses large and small.